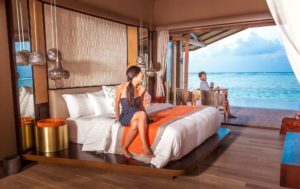 Club Med Finolhu Villas, on the island of Gasfinolhu, discover the eco-nature villas located on a prestigious jewel like lagoon, in the heart of an exceptional natural location. 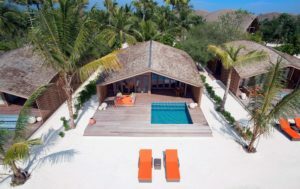 On this private island of over 12 acres, 52 refined villas, reserved for couples, are positioned as the perfect equilibrium between modern luxury and the natural charm of the Maldives. Located 5 minutes by boat from the village of Kani, you will also be able to make the most of its infrastructure and available activities. Beach Villa-Sunrise Longing for an island paradise? As the sun rises, hear the lagoon calling to you. From the understated, brightly colored comfort of your villa, you can see your own pool. Why not jump in, just to check you aren’t dreaming? Equipment: Telephone, Expresso machine, Kettle, Ice bucket, Bathroom (With bath and shower), Dressing room, Wi-Fi Access, DVD / Blu-Ray player, Triple British electrical sockets / 220 volts, Minibar refilled daily, Air conditioning / Heating system, Safe deposit box, Socket Type E : 220-240 V, TV Screen, Iron and ironing board in the room, Umbrella, Coffee/ tea making facilities, Outdoor private shower on terrace or balcony, Anti-mosquito plug, Sun lounger, Bluetooth speakers, Outdoor private bath on terrace or balcony, Sofa couch. 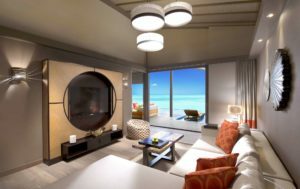 Beach Villa-Sunset Romantics who love sunsets will appreciate this beachside Villa. 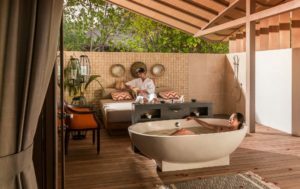 From the swimming pool on the teak terrace to the outdoor bathroom, not to mention the al fresco daybed: everything is luxurious. Equipment: Telephone, Expresso machine, Kettle, Ice bucket, Bathroom (With bath and shower), Dressing room, Wi-Fi Access, DVD / Blu-Ray player, Triple British electrical sockets / 220 volts, Minibar refilled daily, Air conditioning / Heating system, Safe deposit box, Socket Type E : 220-240 V, TV Screen, Iron and ironing board in the room, Umbrella, Coffee/ tea making facilities, Outdoor private shower on terrace or balcony, Anti-mosquito plug, Sun lounger, Bluetooth speakers, Outdoor private bath on terrace or balcony, Sofa couch. Over water villa-Sunrise With a turtle-shell shaped roof and wooden stairs taking you straight into the turquoise sea, this Villa grabs the imagination. The decor is understated and contemporary, all the better to complement the natural surroundings outside. Equipment: Telephone, Expresso machine, Kettle, Ice bucket, Bathroom (With bath and shower), Dressing room, Wi-Fi Access, DVD / Blu-Ray player, Triple British electrical sockets / 220 volts, Minibar refilled daily, Air conditioning / Heating system, Safe deposit box, Socket Type E : 220-240 V, TV Screen, Iron and ironing board in the room, Umbrella, Coffee/ tea making facilities, Outdoor private shower on terrace or balcony, Anti-mosquito plug, Sun lounger, Bluetooth speakers, Outdoor private bath on terrace or balcony, Sofa couch. Over water Villa-Sunset The entire villa, with its bright, contemporary interiors, opens out onto a large wooden terrace with a swimming pool and sun loungers. Below, clown fish, turtles and rays play in the clear waters. Equipment: Telephone, Expresso machine, Kettle, Ice bucket, Bathroom (With bath and shower), Dressing room, Wi-Fi Access, DVD / Blu-Ray player, Triple British electrical sockets / 220 volts, Minibar refilled daily, Air conditioning / Heating system, Safe deposit box, Socket Type E : 220-240 V, TV Screen, Iron and ironing board in the room, Umbrella, Coffee/ tea making facilities, Outdoor private shower on terrace or balcony, Anti-mosquito plug, Sun lounger, Bluetooth speakers, Outdoor private bath on terrace or balcony, Sofa couch.